Divide dough in half. Roll each half 1/4 inch thick on lightly floured surface. Cut into desired shapes with 2- to 2 1/2-inch cookie cutters. Sprinkle with granulated sugar. Place on cookie sheet. Baking (cookie) sheets should be at least 2 inches smaller than the inside of your oven, so the heat can circulate completely around them. Be sure to arrange the oven racks, before you preheat the oven, so that you can bake in the center of the oven. Or jigger the racks to make room for two baking sheets—then rotate the pans halfway through baking. Choose your baking sheets wisely—look for heavy, shiny aluminum sheets with no sides that allow air circulation and make it easier to slide cookies onto wire cooling racks. Dark sheets absorb more heat, making it hard to control browning. Insulated baking sheets slow down baking, providing control but also requiring longer bake times. As you bake, be sure to allow baking sheets to cool before you place fresh cut-outs on them for the oven. If you don’t have wire cooling racks, sprinkle sheets of waxed or parchment paper with coarse sugar. Warm cookies laid on the sugar-sprinkled paper will cool without getting soggy. 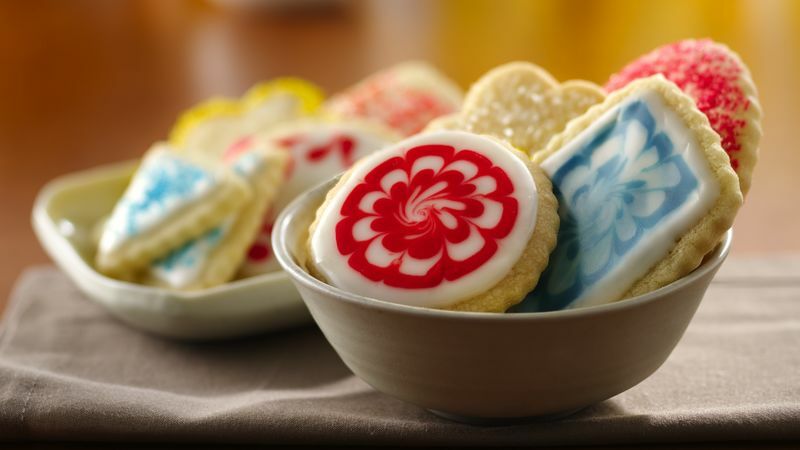 For swirl frosted cookies, frost each cookie with white cookie icing. Pipe 4 to 5 small dots red, green or blue cookie icing or decorating gel on top of each cookie, immediately swirl color with toothpick to create marble designs. You can prevent cookie dough from sticking to the cookie cutter by dipping the cutter in flour between uses. Our Classic Sugar Cookies have such a tender crumb and balanced sweetness, you’d never know how easy they are to mix, roll out and cut. If it’s your first time behind the rolling pin and cookie cutters, take a few minutes to read over these step-by-step sugar cookie instructions that walk you through mixing, rolling and baking. Once you have a counterful of baked cookies ready to go, the real fun begins, as your sugar cookies serve as blank canvases for your colorful creativity. Frosting, icing, sprinkles and colored sugar will make these classic sugar cookies distinctively yours. Check out our best sugar cookies recipes for even more creative ideas. Once you master the basics, you’ll find yourself picking up new cookie cutters wherever you travel, and making classic sugar cookies all year long.